I bought some Grandpa Ott seeds and want to grow them in some kind of container or hanging basket. 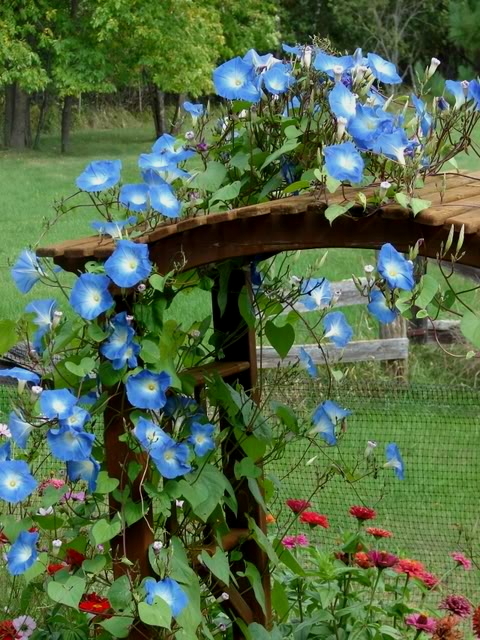 I see photos of morning glories in baskets growing downwards. Has anyone done this? If I grew the seeds in a pot (placed up against a trellis), how large should the pot be? Full sun or partial sun? Appreciate any advice or stories about growing morning glories. Do they attract any pollinators? Truthfully, whereas pollinators flit by and check them out they don’t really seem to feed from them. Partial sun is fine and probably better if they’re growing in a container. I’ve only ever grown them on a trellis; I’m intrigued by the idea of letting them hang. Yesterday afternoon I roughed up the seed coats of the seeds by rubbing them between two pieces of sandpaper. I didn't soak them overnight. Whatever I did worked because the seed codes have been split. I'm doing to hanging baskets and a pot with Garden stakes in it. Wish me luck. Maybe people will post photos of their morning glories here if we're lucky. Edit: Above is incorrect. I was dictating by voice and the autocorrect or whatever typed in that I didn't soak the seeds overnight when I did. Last edited by SpookyShoe; March 9, 2019 at 05:59 PM. 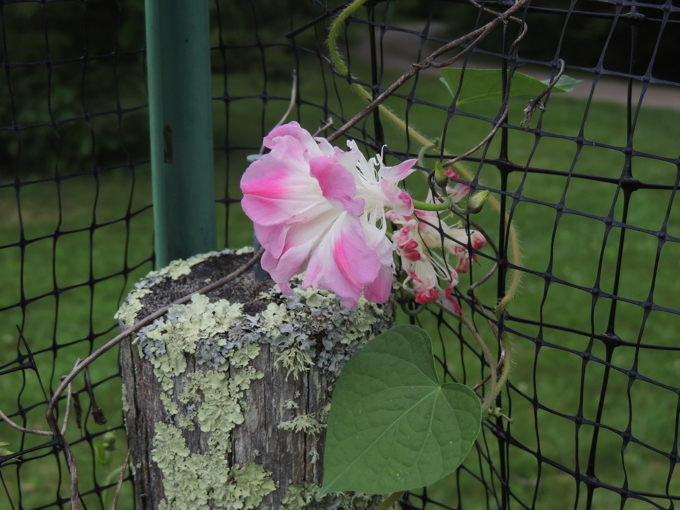 I've loved Morning Glories since I was a kid and my mother grew them on a fence and gate. They make gorgeous flowers. In a tomato seed trade a few years ago, a very nice lady included some morning glory seeds in the envelope. I let them sit in my seed bin for a couple of years and decided to try them in my garden on the garden fence as my mother did. They were beautiful, but they took over some tomato plants in containers near them. I kept cutting them back in hopes they would stay on the fence and leave my garden plants alone. The first fall frost took care of what had become my beautiful morning glory problem. They returned in force when spring arrived the following year. I had forgotten how much seed they produce. I've tried to eliminate them from the garden for about three years but some of that original seed must have buried itself really deep in the soil. I'm expecting more to germinate this spring. I will keep fighting to free my garden from those beautiful morning glory's..
Everything has it's time and it's place, but a vegetable garden is not the place for morning glory's. Grandpa Ott are very prolific and should do fine in a pot...or anywhere else for that matter. We had them in a raised bed with a trellis. When we changed the raised bed to a turf area we got Grandpa Ott for several years in the grass. The trellis I leaned up against a shed and even though it has been five years the GOs still thrive in the rocks around the shed. They are beautiful and persistent. Good idea on the sandpaper, I'll remember to try that! I've soaked mine other years, but still get poor emergence sometimes. I've never grown in baskets or pots, just in ground onto a trellis. Last year a rabbit kept nipping a couple of the vines above ground level. They would grow back but too late to set flowers. As I recall, we had a frost just before the blossoms were ready to open last year, so I never saw flowers. Here in the north I have to get them in the ground early or they won't bloom before September.This is from a previous more successful year. The picture above is called "Heavenly Blue". I have fresh seeds if anyone would like some. They grow wild here in south Florida. I've had the same experience as DonDuck reports, above. Morning Glories are beautiful at first but they're THUGS in a vegetable garden. The blossoms have bred back to tiny red things, and I don't think the vines are propagating from seeds, as for years I have removed all blossoms as they appear and the vines grow anyway. I think the M.G. plants grow from very deep thin roots that overwinter in the soil and can't be pulled out - they just break off if you try, and they come right back if they're sprayed with herbicide. The only good thing about it is that as unwanted, impossible to get rid of weeds, they're not too bad. I've just learned to put up with the vines growing up and all through my tomato, pepper, and other plants. I'm moving my vegetable garden to a new location and going to raised beds this year, and the Morning Glory infestation is one of the reasons I'm doing that. Oh my! I made a typo in an above post. I said I didn't soak the seeds overnight after I sandpapered them, but I did. Last edited by SpookyShoe; March 9, 2019 at 07:32 PM. Beautiful photo ddsack! I hope mine are that pretty. Good luck, Spooky, with your morning glories. I've never had Heavenly Blues come back as volunteers, I think because they mature so late here that the seeds might not be fully developed before they freeze. I kind of wish I did have that problem! 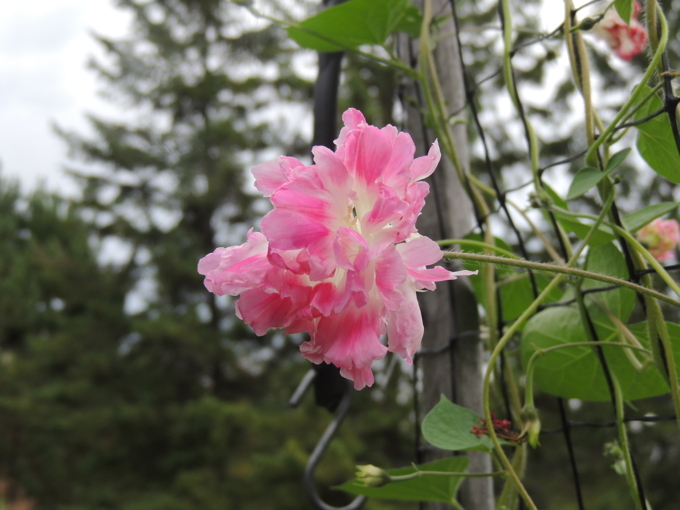 But I have a smaller, fuzzy pink morning glory that does reseed. It is much shorter, smaller leaves and very pretty blossoms, though I was disappointed they were smaller than they appeared in the ads. I grew some next to a border netting fence near my vegetable garden couple of years ago, and it has come back two years in a row, from self scattered seeds. I can see where it might become invasive if you don't pull the unneeded volunteers. I grew in the past. I tried a chocolate morning glory in a basket, and it was nice at first but then got to big and wild looking, maybe if you pruned it.